My asparagus is just starting to come up so this recipe will be great to try! I better get those radishes planted today and I can use some of my beautiful chicken eggs. I know it will be DELICIOUS. I can’t wait to give it a try! 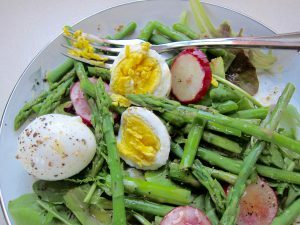 Asparagus and pheasant egg salad comes together quickly, and provides a delicious herald of spring. It’s spring! 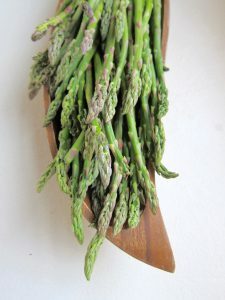 And one of the season’s most beloved vegetables is soon to make an appearance at farmers’ markets: asparagus! And when asparagus or any other vegetable is in season, it’s always good to have a collection of recipes in cue to make the most of the season’s bounty before the next round of seasonal fruits and vegetables start coming in. 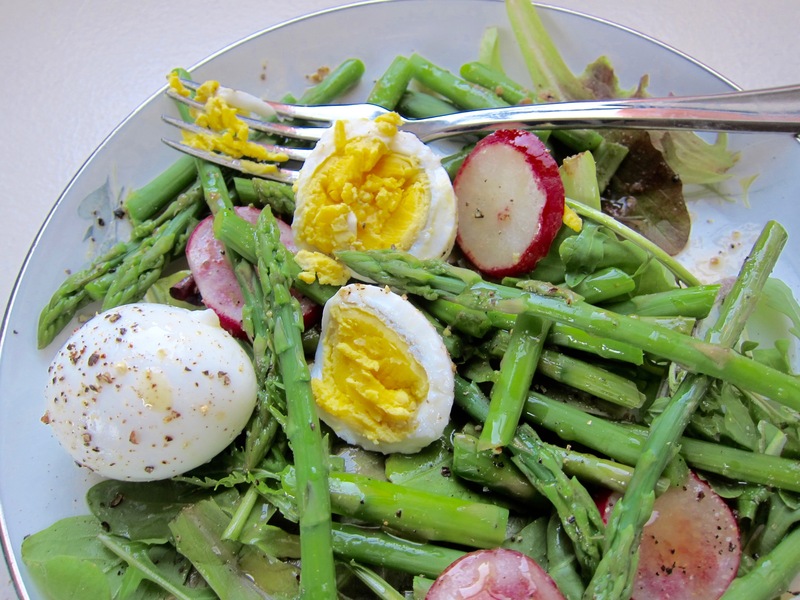 This salad, made with fresh asparagus and pheasant eggs, is refreshing, delicious, and simple. And the use of pheasant eggs is a great example of the flexibility that farmers’ market shopping allows: If you see something at a farmers’ market that simply appeals to you, buy it! You can decide what to do with it when you get home. And never fear, if you still want to try out this recipe but don’t happen to have pheasant eggs on hand, you can use quail eggs, duck eggs, and of course chicken eggs as a substitute. Whatever egg you choose, you’ll find the freshest and tastiest ones at your local farmers’ market. Choose asparagus that is as thin as possible. Choose asparagus that is bright green in color, and try to get the thinnest stalks you can; these will be the most tender. Pheasant eggs are smaller than chicken eggs (there are three chicken eggs shown in the back); and because pheasant eggs have a higher yolk-to-white ratio, they also have a richer flavor. Wash the asparagus and your greens with a bit of vinegar and water when you get home to remove any remaining soil. Drain them, and place them in the refrigerator (if you have a salad spinner, spin the salad greens dry). Hard boil your pheasant eggs. To do this, place your eggs in a pan and cover with water until water is 1 inch deep above the eggs. Bring to a boil, cover the pan with a lid, and remove from heat. 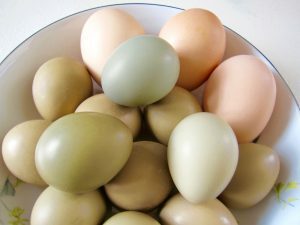 Let the eggs stand for about 10 minutes for pheasant eggs, and 15 for chicken eggs. Cool before pealing (note that because of their small size, pheasant eggs require a bit more time to peal to avoid damaging the egg). Peal your eggs and set aside. Prepare your asparagus by first cutting the tasty tips off to a 3-inch length, cut the remainder of the asparagus into bite-sized pieces. Blanch all of the asparagus by placing it in a pan of salted, rapidly boiling water for about 4 minutes (you want it to be tender, but still have a bit of a bite to it). Drain the asparagus and place in the refrigerator to cool while you make the vinaigrette. Lastly, assemble your salad. 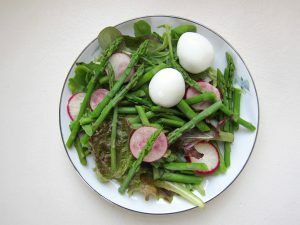 Place your salad greens on a plate, and top with your asparagus and a few slices of onion. Place one hardboiled egg onto each plate, and drizzle your salad with the vinaigrette. This fresh salad is ideal to serve with a light soup or seasoned fish dinner. This salad tastes like spring, and can be used as a side dish at dinner, or a light lunch. This recipe has been adapted from this recipe.